There’s always a story to be told in the ring. Wrestling is like a beefy, sweaty telenovela in terms of its storytelling: it veers towards the wacky and wonderful, trading on big, far-fetched plots which can most easily translate into exaggerated combat. Even from outside a wrestling fandom, you can see the appeal: why else would Japanese wrestler Ace’s affair with a giant panda mascot (and subsequent fight with his wife, also a giant panda mascot) have gone viral? There’s so much in terms of backstory that hovers around the young men training in Glory’s gym for the big spot, to be scouted at Blackpool Bobby’s. Small-town oppression, PTSD, fleeing from war: the pressure points hang heavy in the air but due to the nature of the staging, so many of these hardships are delivered as monologue and diffused the moment another character saunters onto the stage. There’s no follow on from the release of tension, no acknowledgement that these confessions have affected the show at large. Even in the case of an allout brawl between ex-soldier Ben (Joshua Lyster) and asylum seeker Sami (Ali Azhar), the climax of Ben’s monologue feels like a separate piece, outside the scene itself. Lyster imbues a description of seared flesh and lost friends with the aggression that’s characterised Ben throughout, yet the moment he’s finished speaking we’re given no breathing room to reflect. Instead, there are muttered apologies and later the implication of friendship – a hint to development off stage, rather than in the ring. Azhar’s Sami is likewise underserved by the narrative. Azhar gives the night’s stand-out performance, rolling with the inconsistencies of Sami’s characterisation (broken English vs fluency later, a love of Spiderman taken for granted yet his possession of a television in Damascus marked as surprising) and fleshing him out to prove Sami by far the most sympathetic of the wrestlers. Dan (Josh Hart), Jim’s longest-attending mentee, receives the most fully formed arc. His frustration over the name Jim’s emblazoned on a cape is justified: he’s a young British Asian man who’s been taught that the common response to racial slurs is a bowed head. Within the ring Jim advocates no “outside world”, yet his suggestions for fight plots rain down the need to Orientalise Dan in order to make him an entertaining performer. As the action plays out, we see it’s a problem at large across the wrestling circuit: Jim calls out questionable titles with no appreciation for the micro-aggressions they carry. Smelt plays Jim with enough charm that he becomes one of those lovable, kindly if bigoted avuncular types so many of us can recognise from our own families, a man jolly enough for us to turn a deaf ear on his latest opinion. But in making him so charming, and having Jim address the audience directly when no other character does, is director Rod Dixon assuming his audience have chosen a side already? It certainly feels like the role Jim plays isn’t to challenge any ignored prejudices: Jim himself doesn’t learn anything about tolerance and inclusivity, the script killing him off abruptly partway through. Dan doesn’t seem to learn, either: his arc of accepting Sami as the better wrestler is discarded one scene later, his insistence on rebranding himself “The British Dragon” is a leap forward from Jim’s original suggestion but still proves Dan has learned his way to success is open only if he acts the exotic Other. It’s this uncomfortable compromise we’re left with, three young men setting out to change their situation yet stuck in a warehouse pasted with working class mantras. “Without sacrifice there can be no glory”. The show seems to sacrifice its more nuanced points to rush toward a happy ending, finding it cannot reel toward realism in act one and play up the melodrama in the last sequence without leaving the show on a decided sense of dissatisfaction. 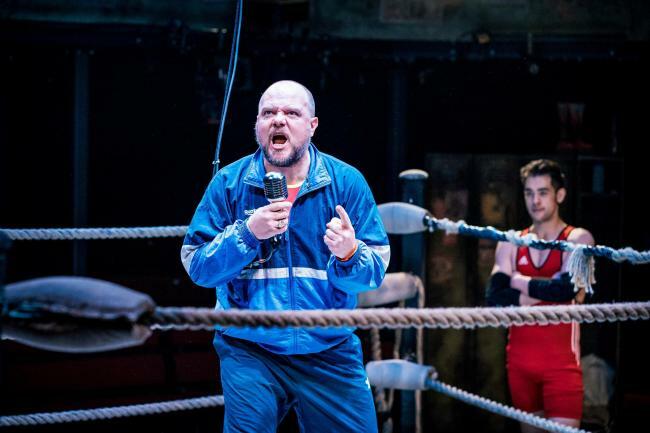 Glory runs at Albion Electric Warehouse until 6 April, then tours to Coventry 10-13 April. More info here.